1. Did I wear it last season? If the answer is yes, then great! You can throw it in the “keep” pile and admire your good taste. But if the answer is no, then consider tossing it. You might be thinking to yourself, “Well, I didn’t really get the opportunity to wear this sweater in the fall, but next year, there will be a time and a place to wear it.” I hate to burst your bubble, but you’re wrong. There was almost certainly an occasion to wear each and every article of clothing in your closet last year, but for some reason or another, this sweater got passed over for other sweaters time and time again. Why? Because you wore something that you liked better instead. It won’t help to feel guilty about neglecting the sweater now, but the knowledge of what you like and dislike might help you make smarter purchases in the future. Most of us have a pair of skinny jeans hiding in our dresser that we hope to fit into again one day. I did myself a favor and got rid of them. 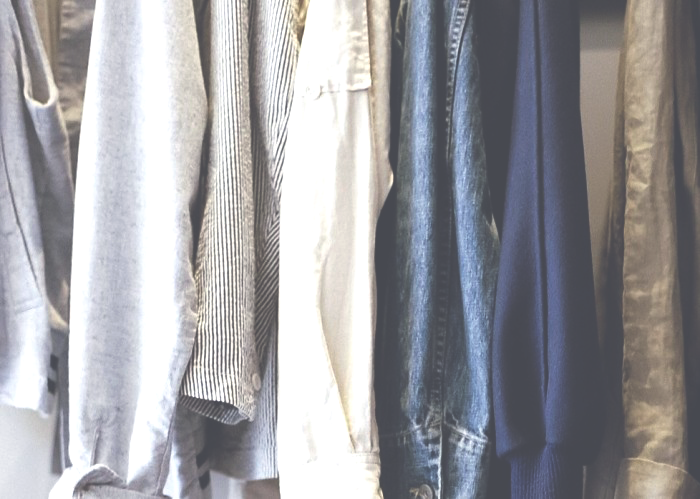 Minimizing your wardrobe goes beyond decluttering your closet; it creates a sense of appreciation. You should keep the clothes you’re in love with, and those clothes should make you feel great about the body you put them on. Don’t let the clothes that don’t fit taunt you from the bottom of your drawer. It’s not that I think you should stop trying to improve yourself, but acceptance and complacency are two very different things. If you’ve had those dream-body jeans sitting unworn in your dresser for two years, they’re probably not doing a whole lot to motivate you anyway. I recently cleaned out my closet and threw away tons of things that were just way too big. This is not because I miraculously lost a bunch of weight, but because I had consistently bought clothes that were just not my size. Learn what real fit looks and feels like. Where do the sleeves fall? Where does the shoulder seam hit? Does it tug at your underarms? Do your pant legs drag on the ground? Should my bra-straps be this tight? When you understand how clothes best fit you, you’ll easily be able to identify which items in your wardrobe don’t look or feel right, no matter how trendy they are. 3. Does it add value to my wardrobe? You should ask yourself this question when you’re shopping as well as when you’re flipping your wardrobe. The matter of value should keep you from duplicating any items in your closet. Let’s be real, black sweaters are a staple. I’ve picked up a second, or third, or fourth because, in the words of my mother, “You can’t have too many black sweaters.” I’m here to tell you that yes, you can. If you have a backup for an item you use a lot, that’s understandable. But otherwise, go through your closet and eliminate the extras. Let them become staples in someone else’s closet. 4. Did I wear this to a frat party once? If it’s even a question, just toss it. 5. Am I only keeping this because it has sentimental value? If you’re going to use sentimental value to weasel your way into keeping something, it better be near and dear to your heart. But let’s face it, if it was near and dear to your heart, you would’ve worn it, and it would not be poorly folded and wrinkled in the back of your armoire. We establish sentimental value because of the fond memories associated with a certain piece of clothing, but by throwing away a t-shirt, you’re not losing the memory of completing your first 5k. The memories are in your mind and likely cataloged in pictures, so you’re free to get rid of the jeans you were wearing when you met your fiancé and that v-neck you wore when you moved into your first apartment. The clothes are not as important as the memories, and if that is the only concrete reason to hold onto something, then you have nothing concrete at all. So go forth and declutter your closet. I can guarantee that with a pared-down wardrobe, you will honestly feel better about your entire living space. With a bag of clothes to take to Goodwill sitting in front of you, you’ll also be able to evaluate your spending habits. Did you spend excessively on clothes that you only wore once? Are you donating clothes that still have the tags on? Take these insights with you next time you have to buy a new piece, and you can become a more thoughtful shopper.